ELC-P3 - Signtex Lighting Inc.
ELC converts an LED luminaire to emergency lighting operation, powered from a Signtex central battery system. Constant power output is factory adjustable to optimize emergency illumination level and fixtures may be on, off, switched or dimmed in normal mode without affecting emergency operation. General lighting fixtures with ELC may be combined with MOONLITE LED™ emergency luminaires and exits in the central battery system, as required. Typical applications for Type P3 may include high-bay high power luminaires with normal power range from 30W to 400W or higher, and AC LED driver output up to 126V. All Signtex central battery systems Series CBS and CBM include fully automatic self-test, self-diagnostics. Series CBM includes the MARS™ Monitoring and Reporting System which provides cloud-based internet communication and fault reports delivered automatically via email for all components of the emergency system. Factory or field installable in the Fire and Electrical Enclosure of listed fixtures. Normal lighting operation is not affected by ELC operation. Compatible with all types of dimming and lighting controls. Standard mount= Hi temp VHB DF tape. Optional flange for screw mount. Constant emergency power output is factory adjustable from 5W to 45W. Up to 4 Channel output for operation in luminaires with up to 4 drivers. Input voltage option to 480 VAC. Output voltage auto sensing range from 21V to 126V. Adjustable emergency lumen output allows optimum settings for any fixture to equal or exceed requirements of NEC and NFPA 101 codes for varying mounting heights and other conditions. Available for LED fixtures operating from 30W to 300W or higher in normal mode. 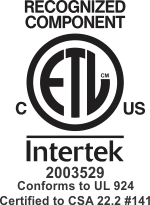 Recognized component in compliance with UL Standard 924 and CSA C22.2 No. 141 for field or factory installation in Fire and Electrical Enclosure. All Signtex Central Battery Systems and MOONLITE LED emergency fixtures are UL Listed to Standard 924.